The event was held at the San Jose Convention Center and drew a crowd of over 5,000. This year North America's largest celebration of Bangla culture took place in San Jose, California from July 2 to July 4. This was the first event of it's kind that I have attended. The conference travels to different cities every year and the last time it was held in San Jose was in 1999 ten years ago. I was genuinely impressed with the execution of this important event. The most impressive aspect of the conference was the organisation and management of such a huge event. The event was held at the San Jose Convention Center and drew a crowd of over 5,000. Many attendees flew in from out of state and abroad and stayed at the nearby Marriott, Hilton or Crown Plaza. There were dance performances, musical recitals, business forums and a film festival. 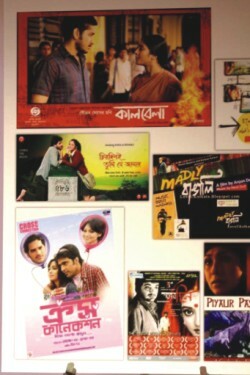 The film festival showcased the latest movies of Anjan Dutta such as “Cholo Let's Go” and “Madly Bangali”. When asked about “Cholo Let's Go” Anjan Dutta explained that the inspiration for the movie was the Bengali spirit of adventure and travel. Bengalis love to travel. And this movie revolves around a road trip that a group of Bengalis undertake on a bus to Darjeeling. The passengers form a motley group with definite eccentricities, some of them very Bengali! The movie was a sheer delight. But besides the plot, the cinematography and images of the beautiful landscape of Bengal were superb. During the screening of “Madly Bangali” there was standing room only. I was determined to leave in five minutes if the movie failed to capture my interest. This was the first movie I have watched standing the entire time! It is a superb movie about a Bangla rock band in Kolkata. Anjan Dutta captures teenage angst and successfully portrays the complicated lives of ordinary people. Among the performers at the conference there were several local Bangladeshi participants. 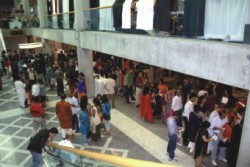 The Bay Area Bangladesh Association and Porshi were huge contributors to its success. Bangladeshi comedian Naveed Mahbub travelled all the way from Dhaka to make several appearances during the three-day event. The audience loved him. Another legendary performer Runa Laila rocked the stage. A most gracious performer, she insisted on audience participation and participate they did! Several ended up on stage and we couldn't see Runa Laila any more! It was all good fun. Rezwana Chowdhury Bannya also gave a brilliant performance. Other wonderful performers who the audience flocked to see were Srikanto Acharya and Lopamudra Mitra. The icing on the cake was the presence of two Bollywood playback singers Anwesha and none other than Shan! They rocked the stage until the wee hours of the night. The most important thing I took away from this conference was knowing that Bengali culture is alive and thriving, not just in Bengal, but in the far corners of the world. After all, Bengalis will be Bengalis, no matter where we live. Nabeel Atique is a Professor of Mathematics and Engineering at Antelope Valley College in Los Angeles County.